Given the uncertainty surrounding the healthcare industry, stakeholders struggle to develop business strategies that can guide both near- and long-term competitive and market positioning and want to assess what the future of healthcare could mean for their businesses. Health insurers, in particular, are trapped – most are hesitant to pivot too far from their current strategies as markets remain profitable, but the forces buffeting the industry could quickly erode their market advantages. What does the future of healthcare hold for key stakeholder groups? Fortunately, tools exist to help healthcare industry businesses with strategic planning amid this extreme uncertainty. Fuld + Company has worked with healthcare payers, providers and industry suppliers, such as pharmaceutical, staffing and healthcare IT companies via our Health + Life Science consulting practice, to chart strategies that acknowledge and confront uncertainty, not ignore it. For instance, scenario planning workshops help develop core strategies that have been tested for resiliency amid multiple plausible futures. It has also developed contingency plans mapped to an early warning system and indicators that foretell near-term emerging conditions. The consistent outcome for our clients is a stronger sense of direction and goal orientation, knowledge of where the organization can position itself in the future, and the immediate steps to get there. 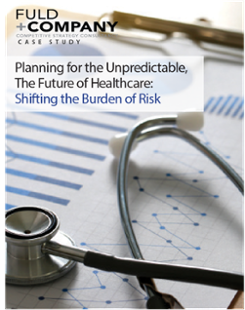 This white paper outlines the key research and outputs of a scenario-planning workshop conducted on behalf of several plans from a nationally recognized payer organization. The study identifies the strategic considerations businesses must plan for, not react to, in the shifting healthcare marketplace.